LONGER LIFE - With its extreme durability, the Twister® has a much longer life than conventional wood pins. And, since it doesn't compact or compress like wood, there is no need to "rest" or rotate the Twister® or worry about moisture content. Twister® won't need to be replaced as often, and additional rotation sets won't need to be purchased. All of this adds up to big savings on your bottom line! R MONEY SAVER - When shopping for bowling pins, the overall pin cost per line is a true indicator of which pin represents the best value for a Bowling Center. 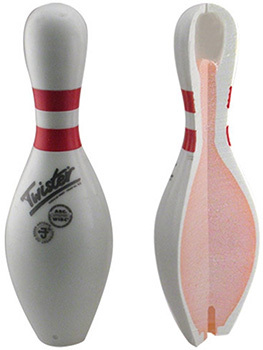 The overall cost per line of the Twister® is less than any other pin in the market. Add to that its consistent scoring, and the Twister® is by far the best value for any Bowling Center. R GREAT WARRANTY - With one of the best warranties in the industry, you can have peace of mind knowing that your Twisters® will be covered longer than most wood pins on the market. Ask your Authorized Twister® Distributor for details.R 100% SYNTHETIC - Twister® pins are world's only USBC approved synthetic pins. "Resting" or rotating them or worrying about moisture content is history. R CONSISTENT SCORABILITY - Since its' shape hardly changes while in play, the flight of Twister® pins remains consistent and true, even after thousands and thousands of lines of use. This means scoring levels remain the same and bowlers can expect the same pin action from day 1! R STONGEST NECK - The neck area of the Twister® is extremely strong. It exceeds the dynamic break resistance of wood pins by far. R BLACK LIGHT GLOW - Along with the white body of the Twister®, the new red stripes glow under the appropriate black lighting and work with all automatic scoring systems. Twister® is the only pin with glow-stripes in real red.